I questioned the other day whether there had been as much warming over the last three decades as is sometimes perceived, pointing out that last year’s temperature was only 0.17C higher than it was in 1981, based on RSS. My choice of years was quite deliberate. Last year was, effectively, ENSO neutral, with La Nina fading out in March to be replaced by a small El Nino during the summer, a fact reinforced by temperatures dropping back down since October. Furthermore, last year’s temperature, as well as current ones, are below the 10-Year average. So picking 2012 cannot be seen as cherry picking in any way, but what about 1981? That year was also ENSO neutral, and, although warmer than some of the bitterly cold years of the 70’s, was not as warm as 1944, as Figure 1 shows. In fact over the period of 1940-81, temperatures had been declining very slightly. However, as reader David correctly pointed out, doing the same calculation on RSS figures since 1981 gave a significant rise of 0.14C/decade, or nearly 0.5C over the period. Figure 2 illustrates this. So how can the two approaches be reconciled, as they are both correct. The answer is quite simple. The trend line is a least squares regression analysis – it is not a straight line plot from start to finish, but takes into account all the results in between. Because it actually got colder after 1981, both during the 1980’s and again in the 1990’s, and because these years slot into the first half of the period, the slope line is tilted down at the start. Simply, the advent of these colder years has created a higher rate of warming than would otherwise have been the case. But what caused temperatures to dip in these years? The eruption took place just as the largest El Nino of the century so far was beginning. 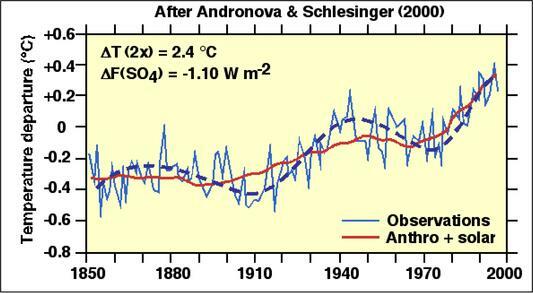 (In fact the volcanic cloud in the stratosphere fooled the satellite sensors which monitor ocean temperatures into thinking ocean temperatures were normal, whereas they had warmed substantially. Thus, scientists were not aware of the El Nino until months after it had started. It is well established that large eruptions like these will depress global temperatures. GISS published a paper in 1997, which attempted to estimate just how much, and found that temperatures after Pinatubo were reduced by about 0.25C. Furthermore, as their graph below shows, the effect can last for up to 5 years. As these eruptions were not climatic events, the resulting warming trend produced by the regression analysis is not giving us a true picture of how the climate has been behaving. To put this right, I have used the GISS analysis to adjust the actual temperature data to what they would have been, in theory, had the eruptions not occurred. As can be seen, the slope of the trend line is less steep. The equations show just how much. So nearly a third of the trend is an artifact of El Chichon and Pinatubo. When the effect of these is removed, the trend falls to 0.098C per decade. And when this is combined with the falling trend of temperatures from 1940-1981, we get a warming trend of less than 0.3C over 70 years. So, taking all these factors into account – the amplifying effect of volcanoes, the longer term view since 1940, and the effect of the AMO – I say again, the underlying rate of warming in the last three decades is much less than is generally perceived. I agree with you. The “scientists” are out to scare people, of course, using events that are scary. Their pronouncements from authority sound so sure and are meant to intimidate. That’s why posts like this one are so important. Also of note is that CO2 levels stopped immediately after these events. If you look at the CO2 graph you’ll note the kinks in the rising levels. Was that more rain washing out the CO2, dumping into the (temporarily) cooler seas? Also of note is that CO2 levels stopped rising immediately after these events. ‘Thanks for an interesting article. I looked up kriging to read more about the method. I find one curious anomaly in chart #4 and yes I did hallucinate a few times back in the 60s. If you look approximately 6 years out past each eruption, the graph shows a large upward heat spike on the surface:ICOADS SST line. That spike following all three eruptions gains approximately 2.5C from the point where the ICOADS line crosses the eruption event to the peak of the ICOADS line 6 years out. Is this just a coincidence? Also, there are 16 peaks in that time span or slightly over 3.5 years between spikes on the surface:ICOADS. It seems so regular, but what would cause that? The surface:ERSST closely follows the same pattern.’. After saying this, Greg Goodman commented that he had noticed this several years before, but that no one saw the validity in it. Someone said that you have to consider smoothing effects when visually assessing graphs. Yet every graph that I have seen still seems to shows what Goodman labeled as a ‘volcanic rebound’. Only the surface ICOADS, ERSST, and the 0-100 meters show this rebound at approx 6 years out from the eruption. Of the 3 volcanoes on the graph 6 years from eruption arrives at the top of the solar max, while Pinatubo 6 yrs out is right after the bottom of the solar minimum. In other words the sun is going full active when the theorized ‘volcanic rebound’ comes into play. Could this have been the reason that the 1997/98 Grand El Nino was so Grand? and after further poking around, I see that the neutron monitor graph at the WUWT solar page closely follows the surface ocean temperature fall and rise. WMO Repeats “Hottest Decade Ever” Mantra | Watts Up With That?